Twenty artists will be selected for an online group exhibit, “PORTRAITS 2018” at Gallery25N; the exhibit and artists will be extensively marketed worldwide to over 30,000 people including art buyers, gallery owners, curators, collectors, etc. Participants must be 18 years of age or older working in any still art medium. One artist’s work will be selected to receive the “Christopher E. Burke Fine Art Grant” of $500. That artist’s work will become the image of the exhibition and will be used on the invitation, video title screen and on all online marketing. 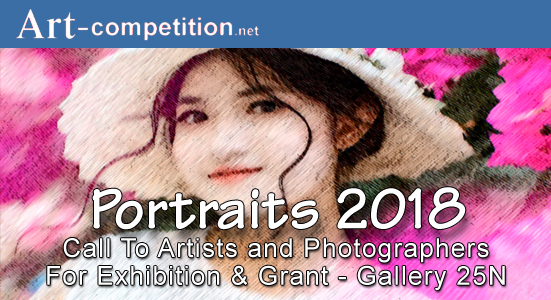 Theme and Selection: “PORTRAITS 2018” – The curators are looking for a portrait showing the inner essence of the subject or a flattering representation, not just a literal likeness. As Aristotle stated, “The aim of Art is to present not the outward appearance of things, but their inner significance; for this, not the external manner and detail, constitutes true reality.” Artists may strive for photographic realism or an impressionistic similarity in depicting their subject, but this differs from a caricature which attempts to reveal character through exaggeration of physical features. The artist generally attempts a represent an expression in great portraiture of character and moral quality, not anything temporary, fleeting, or accidental. • Invitations: An electronic invitation for the online exhibit’s opening will be sent to the combined international clientele lists of Gallery25N.com and Art-Competition.net. These lists exceed 30,000 recipients. • Social Media Marketing: The exhibition, artists and their artworks will be marketed through Art-Competition.net, International Artists Directory and Gallery 25N’s social media-marketing network via LinkedIn, Pinterest, Tweeter, GooglePlus, Facebook, Tumblr, Instagram, YouTube, etc. “Art Market News TM” with over 30,000 subscribers in the art market place worldwide. Subscribers consist of art buyers, fine art galleries, corporate art buyers, exhibit curators, fine art agents, architects, property developers, interior designers and art lovers. ArtMarketNews.net provides links back to the artists’ website. • Online Presence: After the exhibit ends, the artists’ exhibit will remain in the “Past Exhibits” section of Gallery 25N’s website with a back-link to the artist’s websites. PRIZE DETAILS: One artist’s work will be selected to receive the “Christopher E. Burke Fine Art Grant” of $500. That artist’s work will become the image of the exhibition and will be used on the invitation, video title screen and on all online marketing. Not eligible to enter? - Find contest where you are.